Boeing [NYSE:BA] and Royal Air Maroc (RAM) today announced orders for (4) 787-9 Dreamliners – valued at $1.1 billion at list prices – that will enable Morocco’s flag carrier to expand international service. SEATTLE, Dec. 27, 2017 /PRNewswire/ -- Boeing [NYSE:BA] and Royal Air Maroc (RAM) today announced orders for (4) 787-9 Dreamliners – valued at $1.1 billion at list prices – that will enable Morocco's flag carrier to expand international service. The orders, previously listed as unidentified on Boeing's Orders & Deliveries website, include two 787s purchased in December 2016 and two purchased this month. 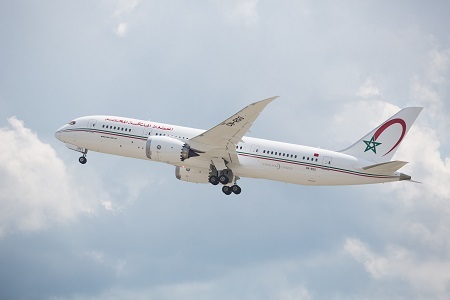 Royal Air Maroc, which has already taken delivery of five 787-8s, will grow its fleet of fuel-efficient 787s to a total of nine airplanes. Royal Air Maroc flies 787s on international routes from Casablanca to North America, South America, the Middle East and Europe, and with the additional airplanes plans to expand service to these areas. "Today Royal Air Maroc has direct flights to 80 international destinations. Thanks to our unique position as a geographic hub and high quality of service, we bring customers from all over the world to their destinations. With more than 850 flights per month to Africa, Royal Air Maroc has the broadest presence across the continent of any airline," said Abdelhamid Addou, CEO and Chairman of Royal Air Maroc. He added, "Our vision is to be the leading airline in Africa in terms of quality of service, quality of planes and connectivity. Ordering new-generation planes such as the Dreamliner puts our airline on the right track to fulfill our vision." "Royal Air Maroc's additional 787 orders are a terrific endorsement of the Dreamliner's economic performance, fuel efficiency and unrivalled passenger experience," said Ihssane Mounir, senior vice president of Global Sales and Marketing for Boeing Commercial Airplanes. "Expanding the relationship between our companies that began nearly 50 years ago, Boeing is proud to support Royal Air Maroc's growth plans within Africa and further connect Morocco to the world." Royal Air Maroc is celebrating its 60th anniversary this year. Its fleet includes more than 56 Boeing airplanes, including 737s, 767-300ERs, 787s and a 747-400. The Casablanca-based carrier operates a domestic network throughout Morocco and serves more than 80 destinations across Africa, the Middle East, Europe, North America and South America. The Boeing 787 Dreamliner is a family of super-efficient airplanes with new passenger-pleasing features. The 787-9's fuselage is stretched by 20 feet (6 meters) over the 787-8 and can fly 290 passengers up to 14,140 kilometers in a typical two-class configuration. The 787's unparalleled fuel efficiency – reducing fuel use and carbon emissions by 20 percent compared to airplanes it replaces – and range flexibility enable carriers to profitably open new routes and optimize fleet and network performance. To serve passengers, the Dreamliner offers large, dimmable windows, large stow bins, modern LED lighting, higher humidity, a lower cabin altitude, cleaner air and a smoother ride. Boeing also is a longstanding partner to Morocco, supporting the country's development of its aerospace industry and workforce. Boeing and Safran are joint venture partners in Morocco Aero-Technical Interconnect Systems (MATIS) Aerospace in Casablanca, a high-quality supplier that employs more than 1,000 people building wire bundles and wire harnesses for Boeing and other aerospace companies.